In his films and photos Artur Zmijewski (1966) explores social standards , by exposing people to invented situations and assignments, and capturing their behaviour on film. Zmijewski often implements social-political strategies in his works, in which he tries to expose deeply rooted collective traumas. For his latest film, Sculpture Plein-air. 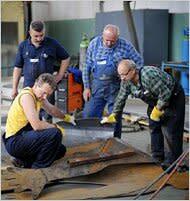 Swiecie 2009, he invited seven Polish artists to collaborate with steel workers from the Polish village Swiecie, to create sculptures for the public space together. This intense project is based on similar projects which were initiated in Poland in the sixties, to contribute to the utopian ambition of a classless society, and the fusing of the arts and industrial technological developments. Sculpture Plein-air shows a more realistic view, and poses the question if these differences could ever be overcome.